* USA troops were among 6 NATO-ISAF service members killed in a Monday 12/21/2015 motorcycle bomb attack in a village near the Bagram airbase, Afghanistan, military officials told CNN. A suicide bomber on a motorbike carried out the attack on a joint patrol of Afghan and coalition forces at about 1:30 p.m. in the Bajawri area of Bagram district, said Waheed Sediqi, a spokesman for the governor of Parwan province. 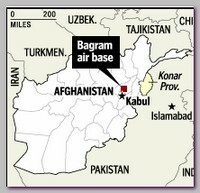 The area is close to the U.S. base in the Bagram district of northern Parwan province. The Taliban said in a tweet that it had used a motorcycle to carry out a suicide attack on a crowd of U.S. troops in Bagram at about 1 p.m. CNN could not independently confirm the claim. The names of those killed were not immediately released. The Taliban claimed responsibility for the attack, which coincides with a major insurgency push in Helmand Province. Over 90 Afghan security troops have been killed over the past two days as the militants threaten to take over the volatile southern province, according to deputy governor Mohammad Jan Rasulyar. Only Afghan army facilities in the district had not been taken by the insurgents he said. Also on Monday An Afghan-American woman Lisa Akbari was shot dead by a Mullah (religious Islamic title ) living in the same apartment complex in Afghan capital Kabul as she was leaving the gym of her apartment complex. Investigators have seized documents from the mullah’s residence that show he allegedly has links to terrorist groups, but the chief did not specify which groups.